For new home builders, Portland, Oregon is the mecca for all that is trendy and modern. When Portland home builders refer to modern home design, they actually refer to trends that began in the early 1900s. Form the follows function: A home’s design always follows its purpose. Simplicity: Modern home design leaves out unnecessary elements considered superfluous. Visual expression: Modern homes often integrate structural elements into their design. Truth to materials: Building materials, like wood or concrete, are incorporated into a home’s design instead of being hidden or altered. Use of horizontal and vertical lines: Straight lines give modern homes a sleek look. Depending on whom you ask, modern architecture and design are the result of social and political changes, technological innovations or a rebellion against lavish Edwardian and Victorian homes. Modern homes grew in popularity during the Art Nouveau period as homeowners were attracted to the long, straight lines, geometric shapes and simple aesthetics. As the Arts and Crafts movement took over Europe and the U.S., modern design began to incorporate a more organic feel. For example, some designers left wooden beams exposed in homes to be used as decorative elements and incorporated large windows that let in an abundance of natural light. Today’s modern homes are still rectilinear, feature open floor plans and include aesthetically sensitive features. Portland home builders think that the best way to see examples of modern homes is to participate in the Portland Modern Home Tour. The tour showcases modern cutting-edge home designs and trends that serve as inspiration to the rest of the country. 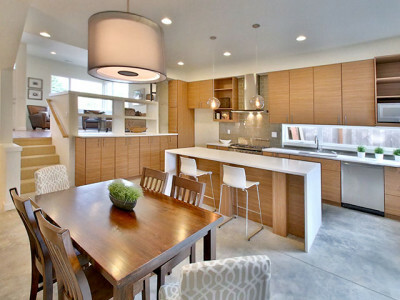 Contact H. Hudson Homes to learn more about their new modern homes in Portland, Oregon.